Italian or Spanish 17th-century red morocco with arms and name on front cover: Don Pedro de Aragon. Executed ca. 1400 for a man whose patron was St. James; Don Pedro de Aragon; his bequest to the Benedictine monastery of Poblet in Spain; purchased by J. Pierpont Morgan (1837-1913) from Ludovic Badin in 1907; J.P. Morgan (1867-1943). Ms. book of hours for the use of Rome (Hours of the Virgin); written and illuminated in northern France, ca. 1400. 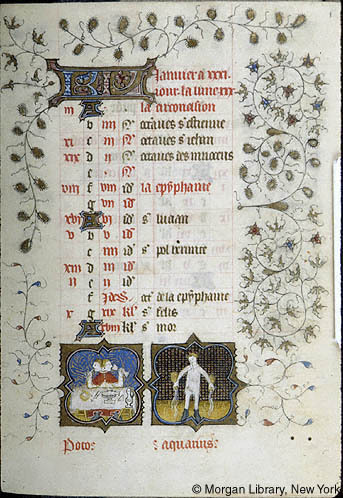 Decoration: 18 half-page miniatures, 24 calendar vignettes.